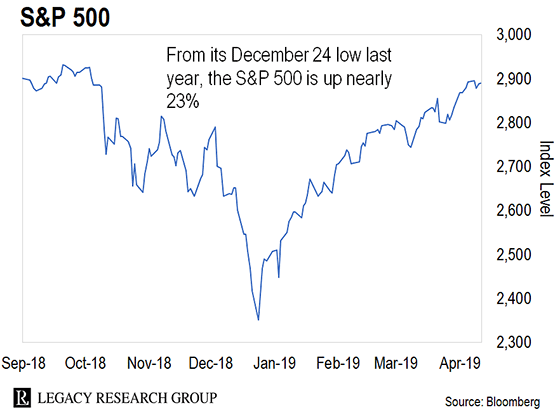 Between last September and December, the S&P 500 plunged just shy of the 20% needed to qualify as an official bear market. But in 2019, stocks are off to the races again. As you can see from the chart above, from the December 24 low last year, the S&P 500 is up nearly 23%. The index is now within spitting distance of its all-time high of 2,931 points. In today’s dispatch, we’ll show you why drinking the mainstream’s Kool-Aid on the bull market will get you burned. And we’ll show you the steps you can take to make sure you’re prepared when this bull market finally gives way to the inevitable bear. You might be offended by this message. So, if you have thin skin, please ignore this now. A colleague of ours – a gentleman labeled “arrogant” and “pompous,” among other colorful descriptions – has found what he believes will be the greatest moneymaking opportunity of 2019. We’re talking about the CBOE Volatility Index (VIX). We won’t get into the weeds of how it works. But, put simply, the VIX rises when investors see more turbulent times ahead for stocks. And it falls when investors see calmer waters ahead. This makes it a great barometer for how investors are feeling about the stock market. And on Friday, investors were feeling as calm and optimistic as they have been all year. As you can see, that’s when the VIX hit its low for the year. The S&P 500 is close to a new all-time high. And as the VIX tells us, investors are as optimistic as they have ever been. To most folks, that sounds like a great time to get into stocks. But it’s during times like these that traders will do well to remember that periods of low volatility are ALWAYS followed by periods of high volatility – and vice versa. In other words, the VIX warns you that the stock market is at extreme levels… and vulnerable to a reversal. 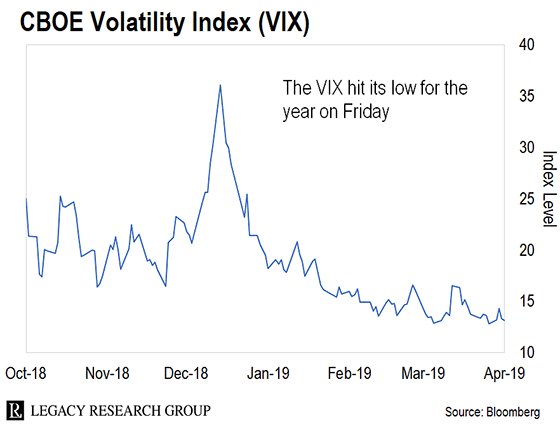 Last Christmas Eve, the VIX closed at 36 – near its highest level for all of 2018. Investors were scared. The market was in freefall. And volatility was spiking to extremely high levels. That marked the low for the S&P 500. Over the past three months, stocks have been rallying. And volatility has been falling. We now have the exact opposite conditions we had at the low for stocks last December. So, this is a good time to start preparing for a period of increased volatility. In a moment, we’ll show you how you can prepare for the volatility Jeff sees ahead. And that simple insight is at the heart of how Jeff trades stocks and options. He’s always on the lookout for extreme conditions – either overbought or oversold – where the proverbial rubber band is as stretched as possible and ready to snap back in the other direction. We can all tell when a rubber band has been stretched close to the limit. The rubber at the center of the band stretches thin. Its color fades. It even starts to vibrate just a bit. Then it snaps back. The same goes for the stock market. You can tell when stocks have stretched close to the limit. The indexes stray far away from their averages. The technical indicators reach extreme conditions. The financial television talking heads all pile onto the same side. That’s when the market typically snaps back. The same thing applies to how the VIX moves. It describes how any price or index value tends to move away from extremes in either direction and back toward its long-term “mean,” or average. And it’s as relevant for the VIX as it is for the S&P 500 and individual stock prices. Right now, the VIX is stretched to the downside – meaning investors have reached an extreme level of complacency. That means you can expect it to snap back in the direction of fear. During periods of uncertainty, and during periods of inflated asset prices, cash is KING. But when stocks are moving higher, everybody wants to ride that train. Stocks eventually top out. Prices fall. And those unfortunate souls who borrowed everything they could to ride stock prices higher are often forced to sell stocks near the end of the decline. Meanwhile, folks who held onto their cash as stocks pressed higher into overbought conditions now have the luxury of buying stocks at sale prices into a declining market. In other words, by holding plenty of cash, you can turn the next bear market to your advantage. How does one define the words and the reality of what they really are? I would think that capitalism is a free, unfettered system of enterprise and has no interest in humanity. Socialism may be defined as a system of human activities benefiting the collective interest of any group. Some of your readers would have it more one way or even a pure system of one kind. We started out trying capitalism and found the base human instincts takes over to get ALL of the gold. “It is mine and you can’t have any of it” mentality created the unions to demand that human-worker slavery was not the order of the day. A number of laws were passed to stop the formation of monopolies and slave conditions. Whoops, there goes capitalism. Was that socialism creeping in because it considered the welfare of the nonowner? 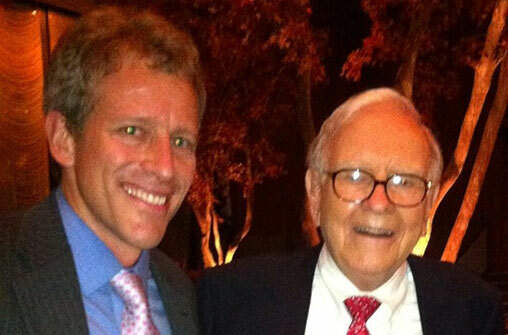 I grew up in a time when most companies respected and valued their employees. In the system we have now, almost all companies provide no benefits – except those that have a social conscience. Thank you, Bill, for your wonderfully insightful and right-on “Conversations With a Ghost” and “A Message From the Future.” As I said before, you should be president. You would be so amazingly good at saying it the way it is, and managing things much better, that people would wonder how and why they tolerated crooks, fools, militants, puppets, and reckless spenders in government so long. Politics has been, and is, a messy, fraudulent, crooked business. However, if you have the courage, and can raise the support and money, please run for president. You would be a very refreshing, welcome leader for us Americans. Many presidents, including Trump, had no previous political experience, so don’t worry about that. Just speak what you see, think, and write. Do you agree with Dean G.’s definitions of capitalism and socialism? Or do you think he missed the mark? Write us at [email protected]. 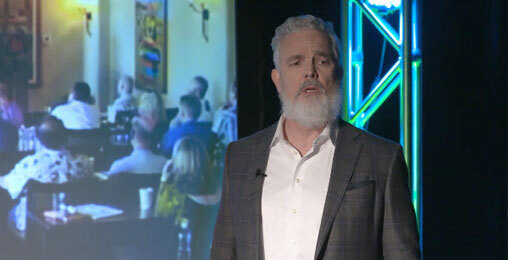 Our tech investing expert, Jeff Brown, put together a new video presentation on the best ways to profit as the AI industry grows over the next few years. Watch it right here.